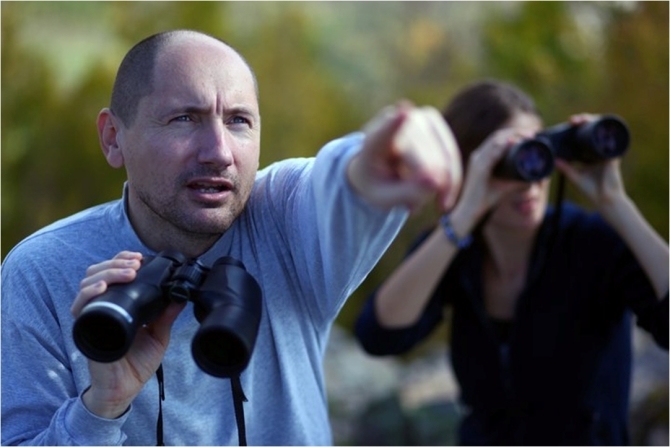 Stoycho Stoychev, a nature conservation colleague from the Bulgarian Society for the Protection of Birds is one of the winners of the 2014 Whitley Awards. The 2014 Whitley Awards Ceremony was held on the 8th of May at The Royal Geographical Society in London, hosted by Kate Humble and the awards presented to the winners by HRH The Princess Royal. Stoycho is a winner of the specific Whitley Award donated by Fondation Segré for his work on the project about the imperial eagle as a flagship species for saving the wild grasslands of south-eastern Bulgaria. The winners were selected from a field of 170 nominees from around the world. This prestigious international prize honours exceptional individuals working in grassroots nature conservation initiatives in the world’s developing countries, and who often face humanitarian, environmental and political challenges in the projects they undertake. Stoycho Stoychev is the Conservation Director of the Bulgarian Society for the Protection of Birds (BSPB). Thanks to his efforts, the imperial eagle population in Bulgaria has doubled over the last decade, to 25 breeding pairs. By establishing the imperial eagle as a flagship for wild grassland habitats, Stoycho is bringing this species back from the brink of national extinction whilst protecting other endangered species including the European souslik, marbled polecat, saker falcon and land tortoise. Rewilding Europe works very closely with Stoycho in the Rhodope mountains, hopefully soon a new rewilding area in our portfolio. Very warm congratulations, Stoycho, well deserved! And please keep going in the great nature conservation work you are doing!